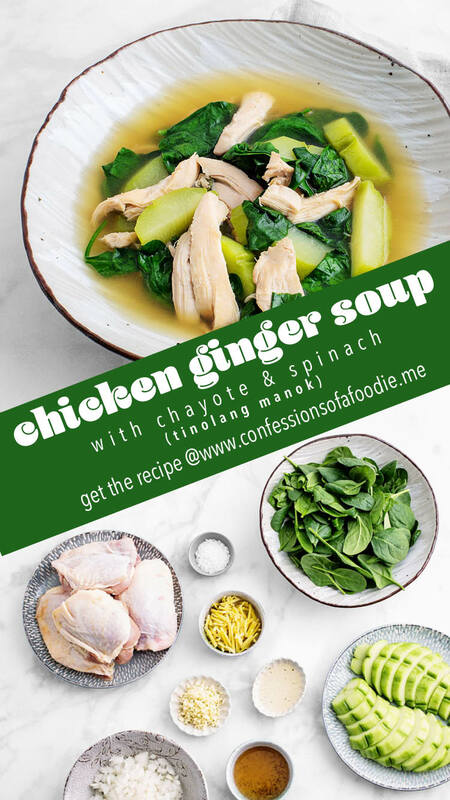 This soup is my version of a chilhood food memory: Tinolang Manok, a Filipino chicken soup that a friend's mother served me when I was in my teens. It's warming, comforting and ginger forward and utter perfection during cold winter months. The city of my childhood was diverse. My high school yearbook is filled with school photos of every color. My personal circle of friends could have been a United Nations poster. It's made me appreciate all that makes up who we are, as individuals and as citizens. My childhood friends were white, Mexican, Spanish, Chinese, Filipino, Vietnamese, black, Jewish, Samoan, Italian and Greek. We acted on stage together. Ran student government together. Played football together. Cheered each other on. Marched in band together. Debated each other. Listened to each other. Cried with each other. Supported each other. Shared meals together. We also had sleepovers. Oh how I loved sleepovers. My parents allowed me to have them and go to them from a pretty young age. I loved it. Sleepovers allowed me to get glimpses into how other people lived — how parents interacted with their children; how my friends interacted with their siblings; and most importantly to me, what foods they gathered around the table for. 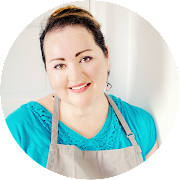 I loved comparing the different types of food to what I was already familiar with at home. One close friend’s house in particular that I slept over at often was a Filipino household. It was at her home that I learned to appreciate lumpia, poncit, chicken adobo, garlic fried rice and a soup I loved that, until recently, I had no idea what it was called, just that I loved it. It is this soup that brings us here today: Tinolang Manok — chicken cooked in a ginger, garlic and onion scented broth with either green papaya or chayote (sayote, is the name in Tagalog) and green chili leaves (my friend’s mother substituted spinach for the chili leaves). 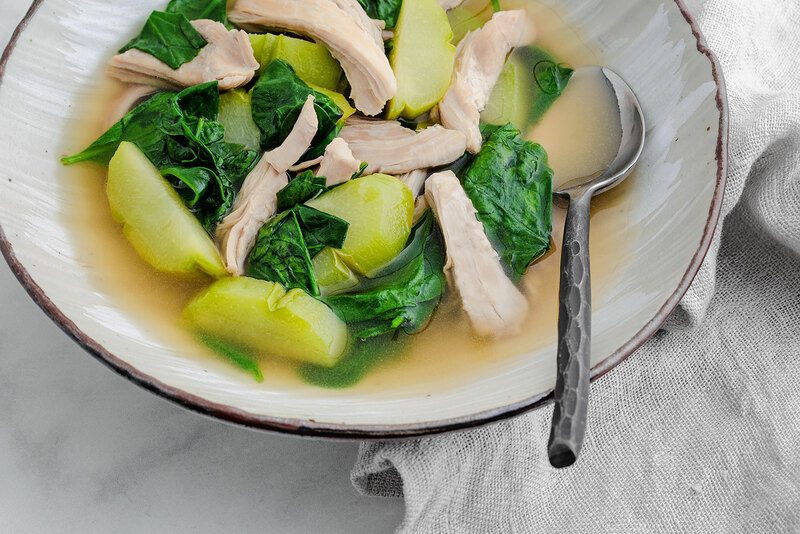 I’m using chayote, because you know by now how much I love it, and tossing in some spinach. Not having the benefit of adult me watching how my friend’s mom made it, I searched for references to the recipe and then proceeded to adapt it to the way I cook and build flavor. Because I prefer the richer flavor that dark meat brings to soups, I started with skin on, bone-in chicken thighs. Liberally seasoning them with salt and pepper before browning them in my dutch oven until nice and golden. 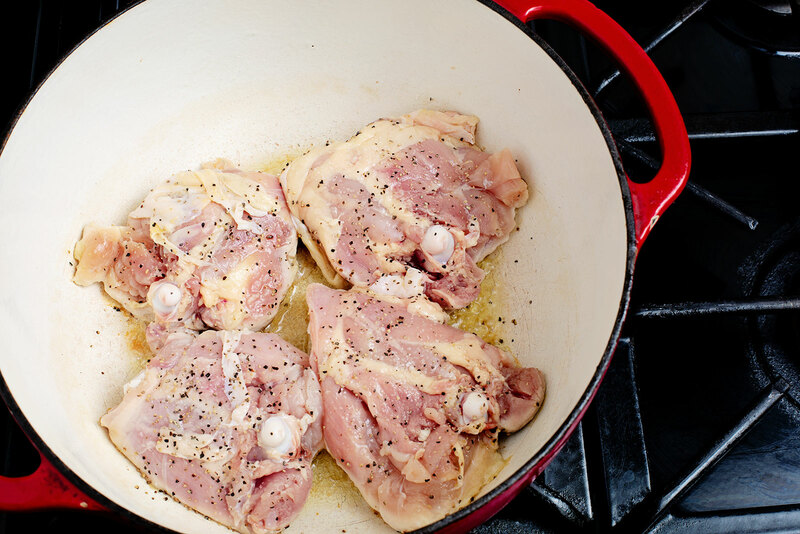 After removing them to a plate and discarding most of the chicken fat from the dutch oven, I added lots of julienned fresh ginger and a quick splash of water to help bring up those brown bits of flavorful chicken stuck to the bottom of the pot so they could mingle with the ginger. Next came chopped onion and garlic though I suppose you could get away with not having to chop them as fine as I did since the final broth gets strained. More on that later. 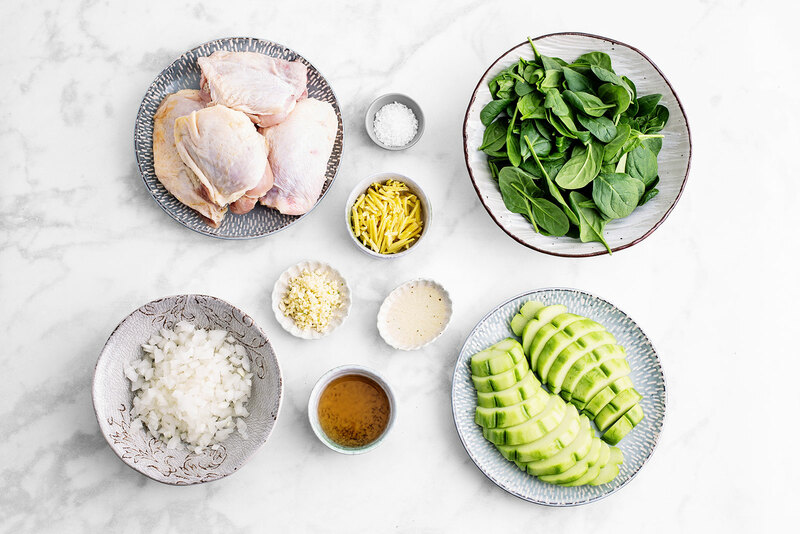 Once the vegetables are soft, the chicken goes back in along with 2 quarts of water and the main seasoning ingredient: fish sauce. Let me just say this right now, we need to get over the fear of fish sauce. In moderation, it is not at all fishy tasting. It is, however, a salty umami bomb and can’t be skipped in this recipe. I’m really not big on seafood, only having come to terms with it over the last few years, the adult me trying to figure out what all the fuss is about and I’m slowly starting to incorporate some form of mild fish into my life several times a year, so trust me when I say, I cook with fish sauce often for the umami component it brings without a “fishy” aftertaste and I live to tell the tale. With the help of a little chicken bouillon, the soup simmers away for a mere 35 minutes. On a low simmer that is. Too rough of a simmer and the fat from the chicken will emulsify back into the liquid resulting in a cloudy broth. A gentle, just barely there simmer will produce a clear, lighter broth that is not just more pleasing to the eye, but rolls around on the tongue more playfully instead of cloyingly. At the thirty minute mark, the chicken is once again removed from the pot and the broth is then strained, all the veggies having given up their life for the good of the soup. The broth is returned to the quickly rinsed pot. Meanwhile, carefully so as to not burn yourself, the skin is removed from the thighs and tossed aside while you use two forks to shred the chicken and pull it off the bone. 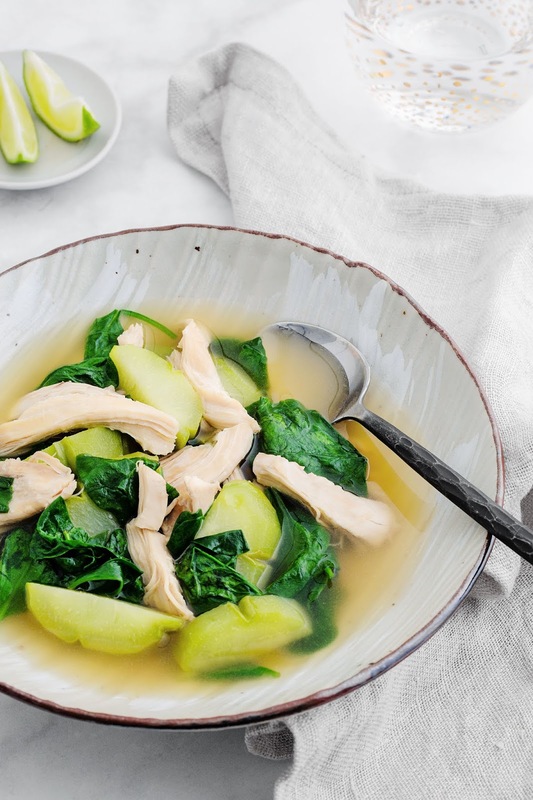 The shredded chicken gets returned to the beautifully clear, ginger-scented broth along with the peeled and sliced chayote. The soup is simmered until the chayote is easily pierced with a fork, about 15 to 20 minutes. Once the chayote is perfectly tender but not mushy, a few large handfuls of tender baby spinach is tossed in, gently submerged and, with the heat off and lid on, the spinach is given a mere two minutes to wilt before serving. Adding the spinach with the heat off ensures it gets tender but remains a bright green with no bitter after taste often accompanied with over-cooking spinach. 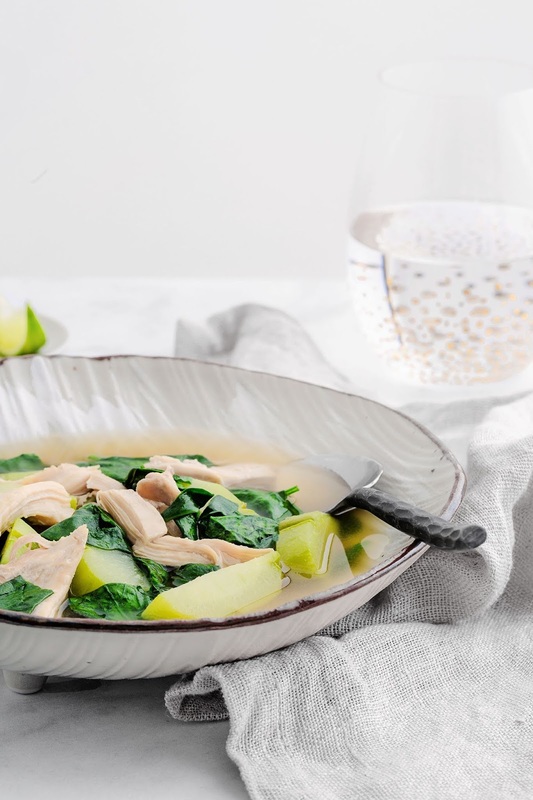 A squeeze of lime over the served bowl adds the final bright note to this wonderfully comforting chicken soup, perfect for this cold weather and light enough to be enjoyed anytime of year. Until next time, stay warm my friends and as always … ¡Buen Provecho! Liberally season thighs with salt and pepper on both sides. Heat the oil in a dutch oven or large soup pot on medium heat. Once hot, add the chicken, browning on both sides. 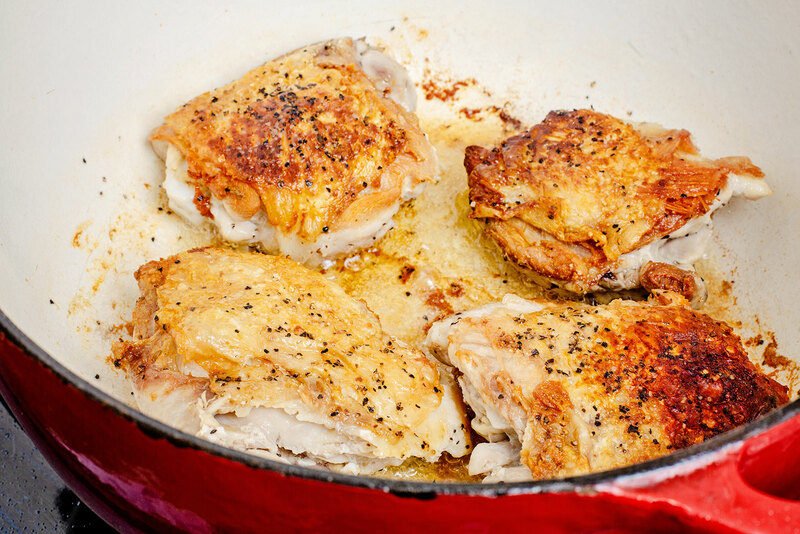 Remove chicken to a plate and drain away all but 1 tablespoon of the chicken fat. Add the ginger to the pot and sauté for 1 minute then add a splash of water, stirring to loosen up the browned bits stuck to the bottom of the pan. Continue stirring for one minute then add the onions and garlic, sautéing until the vegetables are tender, about 3 to 5 minutes longer. Return the chicken to the pot along with any juices they released. Pour in 2 quarts of water, add the fish sauce and bouillon, stirring well to incorporate then cover and bring to a boil. As soon as the soup starts to boil, turn down the heat to the lowest setting to just barely produce a simmer and set a timer for 35 minutes. 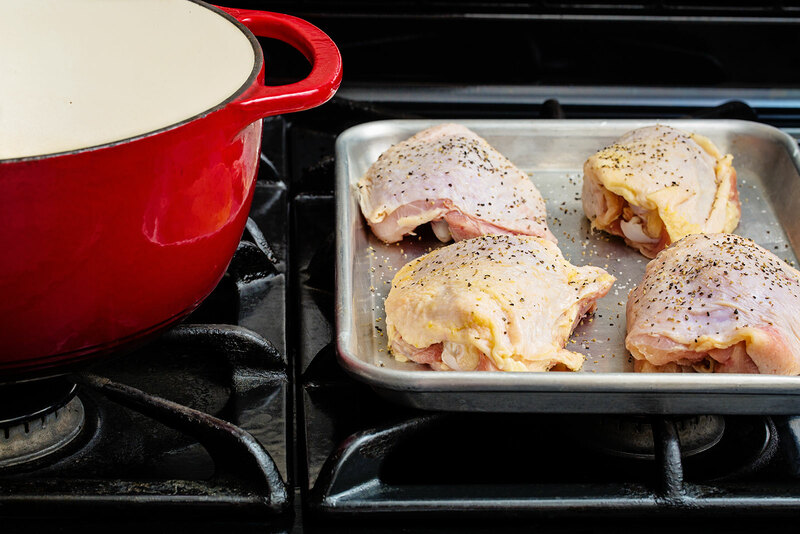 Once the timer goes off, remove the chicken to a clean platter; set aside. Carefully strain the soup, discarding the now spent veggies. Rinse out the dutch oven or soup pot and return it to the heat on medium low, add back the now strained and clear broth. Remove and discard the skins from the chicken. Using two forks, shred the chicken, pulling it away from the bones; discard the bones and return the shredded chicken to the simmering broth. Taste the broth and add more salt if needed. 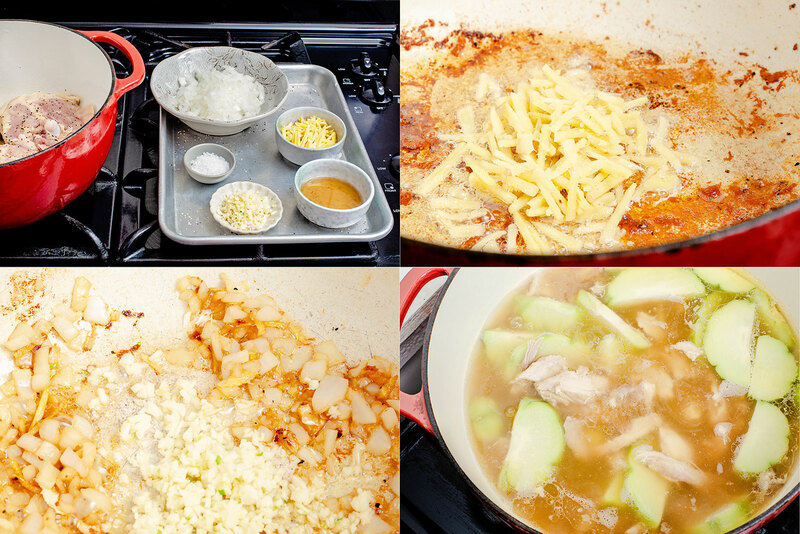 Add the chayote and simmer for 15 to 20 minutes or until the vegetable is fork tender but still firm. Turn off the heat. Add the spinach, pushing it down so it's submerged. Place the lid on the pot and let the spinach wilt for two minutes before dividing the soup between 4 large soup bowls. Garnish with a squeeze of lime.